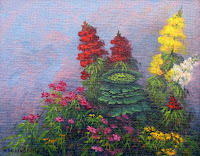 "Snapdragons" was painted last weekend at the Art in the Garden event during the International Flower and Garden Festival at EPCOT. 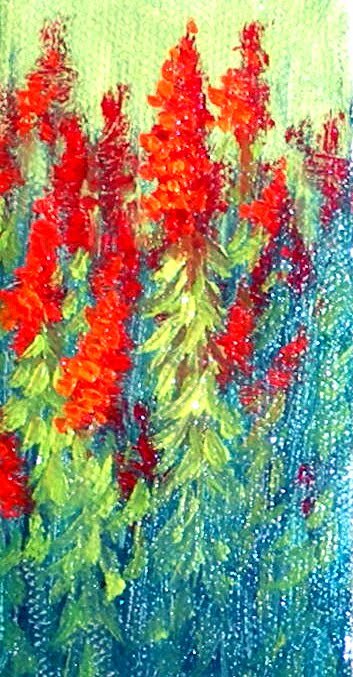 The bed of snapdragons was so thick and blazing red against the green grass I had to paint them! The painting is 4" x 2" on gallery wrapped canvas. Bidding starts at 99 Cents. Shipping and packaging are FREE. The deadline is Monday April 5, 5pm EST. We had a very lively series of bids last week that kept me hopping the last few hours. So, remember this is an auction and the winner is determined by the time stamp on your email . EPCOT "Art in the Garden"
For the past 3 days I have had a wonderful time painting in the beautiful gardens in Canada. Well, not really in the country of Canda but in EPCOT'S Canada. 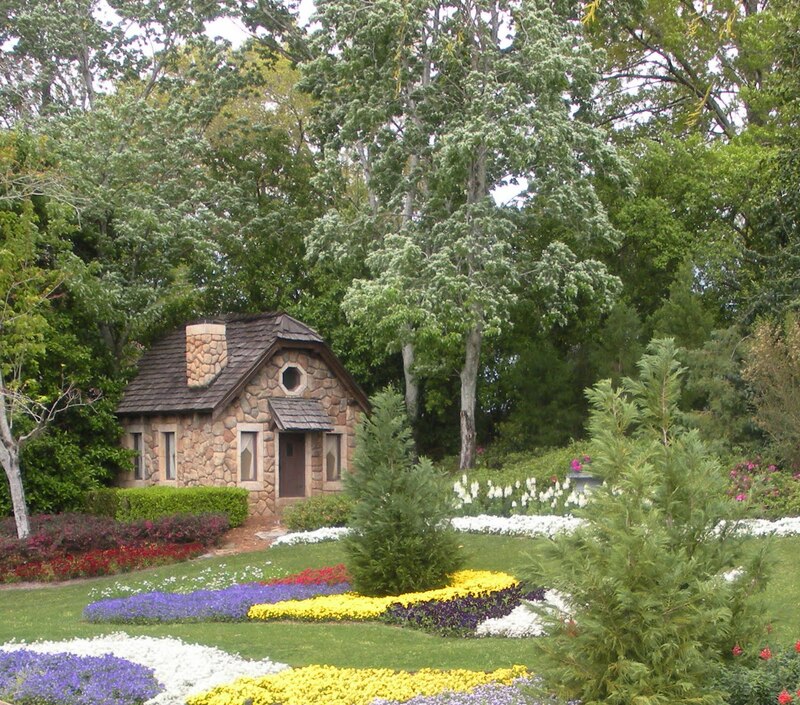 The flower beds could not have been more exquisite, the people friendly, the staff helpful, the food great and the painting fun! This is the 7 Dwarf's house tucked among the trees and flowers. As I painted I exp ected them to come "hi-hooing" down the path. I sold this little 5"x7" painting right off the easel and sent it home to Pennsylvania with a happy family who were very pleased with their one-of-a-kind memory of EPCOT. Here is a photo of the real thing. As I painted I left out and added a few things. The tall evergreen trees blocked the house so I did not include them. That is part of the fun of painting as opposed to taking photographs...you can edit the final image to suite yourself. I certainly hope I will be invited back next year and that my schedule allows me to participate. 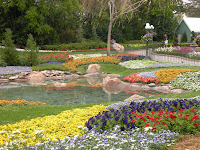 I am thrilled to tell you that I have been invited to participate in the EPCOT International Flower and Garden Festival. I will be painting in Canada during the "Art in the Gardens" weekend March 26-28. This is a wonderful time to visit EPCOT. 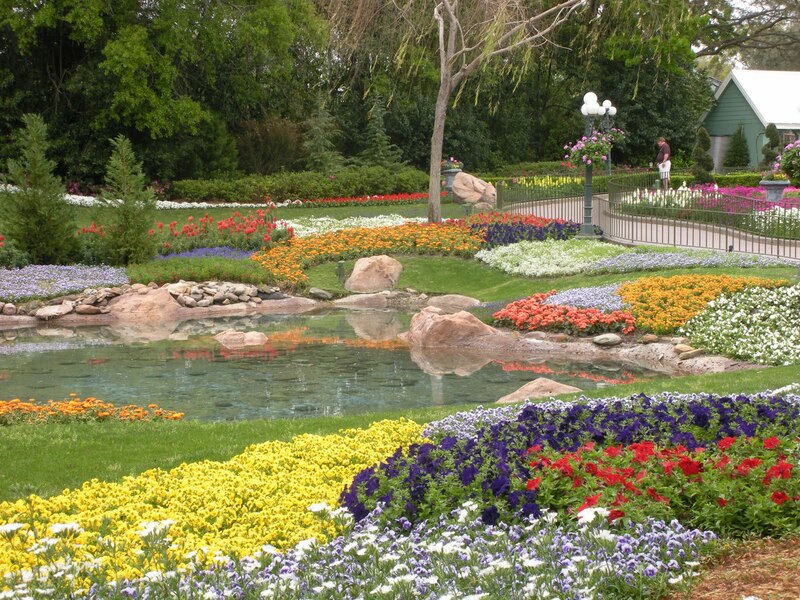 The entire park is filled with fabulous topiaries and beautifully designed flower beds as only Disney can create. I and other plein air artists, Linda Blondheim, Charles Dickinson, and Sharon Crute to name a few, will be painting throughout the park. Watch as we paint...and then take a painting home as a wonderful reminder of your visit. 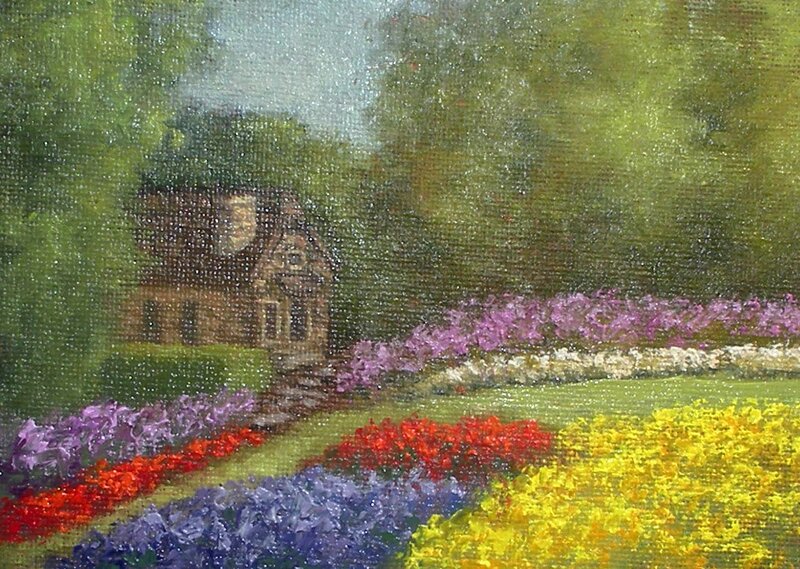 This miniature is 2" x 4" painted in oil on gallery wrapped canvas. 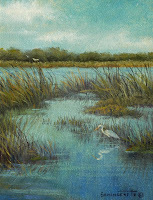 It was inspired by evening paintings I did at the Wekiva Paint Out recently. Although the weather was a challenge the sunsets over Lake Prevatt were worth the effort. Bids may be offered until 5 pm EST, Monday March 29. And, yes, bids still start at just 99 Cents and shipping and packaging are FREE. The Wekiva Plein Air Paint Out Event was a huge success and great fun. Once again, I bunked with my gal pals Linda Blondheim and Elisabeth Ferber. Painted by day and played by night. Thanks to Peter Carolyn for the roaring bonfire and smores the last night..perfect ending for a perfect week. Met some super new-to-this-event painters, Renee Lammers, Sara Winters, Thom Buttner and Mikel Wintermantel to name a few. Event Guru Leslie Long rounded up an impressive group of supporters that donated time, money and/or items to the Paint Out to help ensure the success of this event. The artists were well fed and taken care of in exchange for their week long struggle with the wind, rain and cold to produce an outstanding exhibition of the finest plein air paintings to be found in the state, if not the nation. Sunsets on Lake Prevatt were breathtaking. Not only because of the beautiful sky colors but because of the gale force winds coming off the lake. Standing at the edge of the water painting was definitely a challenge as my umbrella went flying and my painting hand froze. Us Florida natives always forget our gloves. I need to take a few lessons from Renee who paints in the snow in Maine. The canoe launch offered a lovely view of the Wekiva River. As I painted I marv eled at the number of people setting out for a day on the water even though rain threatened and the wind blew. As the boaters returned they all testified to the beauty of the river and the wonder at all the wildlife from turtles and aligators to herons and egrets. A park ranger watched me paint for a bit and told me the Blue Heron I saw across the river and was about to put in my painting is a resident at the river named Henry. All but one of my paintings this year were done at Lake Prevatt. The ever changing weather brought a new look to the lake each day. Some mornings dawned misty and grey, afternoons were bright and windy, evenings were...well ... different from the one before. Plein air painting is all about the light...or lack there of. Yes, this paint out was a challenge, but one I will gladly repeat next year! The painting I am offering for auction this week is a tiny 4" x 2" Oil on Gallery Wrapped C anvas miniature of a Sandhill Crane. These birds are graceful in the air but awkward on the ground and make quite a racket calling to each other. It has been two weeks since I have been able to post a new miniature painting for the auction. There was no WIFI service at Wekiva State Park where I painted all week during the Plein Air Event March 1 - 7. When I returned home after the event I barely had time to unpack all the plein air equipment, wash and repack my clothes, load up my art festival gear and paintings before I was off to the 3 day Vero Beach "Under the Oaks" Fine Art Festival. So, posting a painting during the few days I was home was impossible. Sometimes I "overbook" my schedule and try to be in 2 places at once. Thanks for being patient with me. Under The Oaks Fine Art Festival in Vero Beach is this weekend, March 12 - 14. This is a super festival with lots of great art. Original art only is allowed to hang on the walls of the display tent. A small number of reproductions (25) is allowed in a brouse bin. I have hardly unpacked from the Wekiva Paint out and here I am packing to leave again. But, that is the name of the game this time of year. March and April are packed with paint outs and festivals, and of course, I must attend them all......or at least I seem to think so. I have pictures from Wekiva that I will post when I get a minute. This was the fourth paint out event so I have gotten familiar with the terrain and the best places to paint. Graceful deer crossed my path as I tramped through the brush in the evenings. Turkeys strutted and showed off in the mornings. Even though the weather was not the best....Yep, I will do it again next year.